The colorful, fragrant and refreshing spring is in full bloom in Changping district, 50 kilometers from downtown Beijing, but 27-year-old precision instrument engineering student Shao Meng, sporting a white cotton T-shirt and goggles, is busy in his 60-square-meter flat, seemingly more fascinated by the task of debugging the operating system of a "climbing robot". That's the kind of intensity, focus and dedication you will likely see in specialists across China these days, as the nation accelerates its drive to upgrade its manufacturing sector, in line with the central government's "Made in China 2025" strategy launched in 2015. The grand plan aims to transform the country from the world's factory into a world-leading high-tech manufacturer of top-end products. Think automation, smart and net-connected factories, artificial intelligence, virtual reality, big data, electric vehicles, driverless cars, so on. Shao, a Tsinghua University student, has been on the climbing robot project for over 14 months now. His job is to provide safe and efficient testing-and-maintenance services for over 100,000 wind power generator towers around China. "I love automation and have the full support of my tutors who are all top scholars," Shao said. "I dream of creating something great." Shao is among X-Lab's 116 teams dedicated to technology and intelligent manufacturing or IM. X-Lab is the startup incubator of Tsinghua, which houses China's best scholars in the fields of mechanics, engineering and computer sciences. Mao Donghui, executive director of X-Lab, said there were no such programs even two years ago. The national plan changed all that in 2015. She attributed the current boom in IM programs to significant increase in financial support, government policy and public attention. Besides universities, even enterprises and governments at various levels are making joint efforts to realize the 2025 dream. "As the second-biggest economy, China must rely on independent research and development. We have made big gains in the past few years," said Qu Xianming, executive director of the Chinese Mechanical Engineering Society and an expert on the Advanced Manufacturing Strategy Advisory Committee. 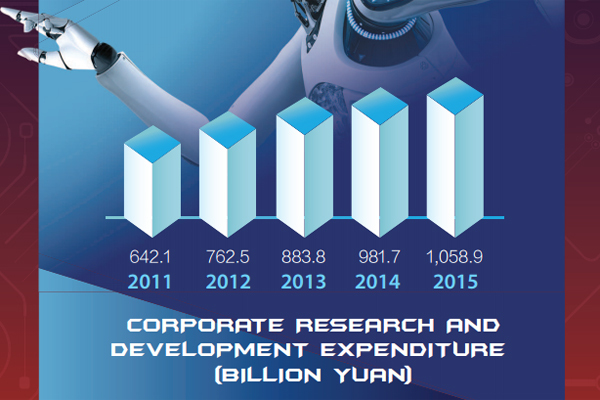 He said last year's R&D inputs from enterprises surpassed that of 2015, providing full steam for technological innovation. 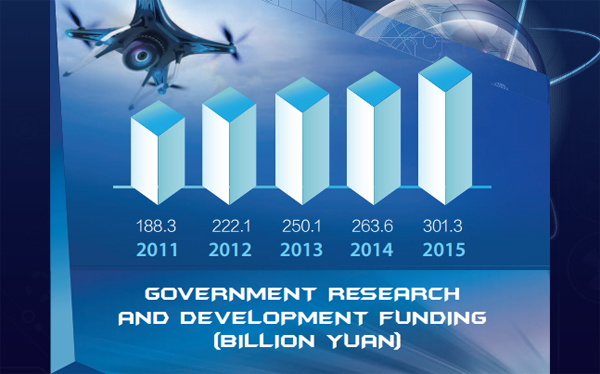 According to National Bureau of Statistics data, R&D funding expenditure reached 1.42 trillion yuan ($205.86 billion) in 2015, double that of 2011, and ranked next only to the United States. 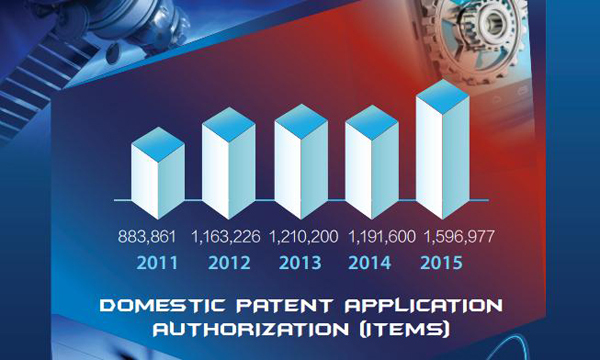 According to a Financial Times report, Chinese inventors filed 43,000 international patent applications last year, up 45 percent year-on-year. This put "the country on track to overtake Japan and the US to become the largest user of the international patent system within two years". Qu said: "It really amazes me that not only big power-transmission equipment manufacturers but even small furniture factories in inland counties are embracing technology and innovation. They are no longer content with just expanding their operations." Fu Dafan, chief information officer of Tebian Electric Apparatus Stock Co Ltd, also known as TBEA, said the company won 216 patents in the past two years, with the R&D spend topping 1 billion yuan. TBEA is China's leading energy equipment producer that has supplied the nation's technology backbone projects as well as a dozen other countries in Asia, Africa and Europe. It has invested in intelligent workshops, production lines and robots, to reap incentives related to the 2025 initiative. According to the Ministry of Industry and Technology or MIT data, high-tech manufacturing contributed more than 20 per cent of industrial growth in the first three quarters of 2016. "R&D and industrial output are correlated, and critical to China's manufacturing upgrade," said Mao of X-lab. "Only with close collaboration among research institutes, enterprises and the government, we can overcome this challenge." But there is a general sense that a missing link keeps China's labs and industrial applications disconnected. To forge a high-level collaborative innovation platform that can link labs and industry, the MIT published "1+X Plan" in mid-February. The "1" stands for the Make-in-China strategy; and "X" refers to a series of supports such as the construction of 15 National Manufacturing Innovation Centers. Wang Shouwen, vice minister of commerce, has said foreign enterprises will be encouraged to join the effort and enjoy the same treatment as their domestic counterparts, in terms of patent applications, government purchases and preferential policies. The first two National Manufacturing Innovation Centers were set up in May 2016 and early this year, respectively. They focus on power batteries and additive manufacturing. "At least three Chinese manufacturing segments－power generation and transmission equipment; communication equipment; and rail transportation－would wrest global lead in the coming 10 years," Qu said. Industry insiders expect this year to be instrumental in making the Made in China 2025 plan a success. For, 25 provinces and municipalities had issued supportive policies by the end of last year, which are expected to give a solid impetus to China's industry. In February, GE China's supply chain president, Steve Meszaros, said that with manufacturing upgrade, the company plans to increase the share of its purchases in China to $10 billion by 2020, which would be the largest for any country in the world. Ha Enjing, a spokeswoman for Siasun Robot &Automation Co Ltd, understands the significance of Meszaros' statement. She said Siasun Robot has supplied products and services worth hundreds of millions of yuan to many leading Western companies, including BMW, General Motors and a US-based flash memory maker. She believes the trend could prove win-win for both Chinese suppliers and Western corporate buyers. John Seifert, worldwide CEO of WPP's Ogilvy &Mather, said in an interview with Xinhua News Agency that Chinese companies are willing to invest in technology, go global to become more competitive, and thus succeed in both local and overseas markets. Agreed Hao Wu, a managing director at Silicon Valley Bank Financial Group, who focuses on management of relationships with venture capital firms. "X-Lab is functioning like a magnet and catalyst. It has attracted top academic talents and facilitated a lot of original technology innovation." SVB, based in California, mainly serves venture capital firms and global companies engaged in innovation. The joint venture bank was set up in 2012. "I believe the platform (X-Lab) could play an instrumental role in upgrading the traditional manufacturing sector and we would be more than happy to assist these efforts." For Tsinghua student Shao, all these developments are harbingers of exciting times ahead. For the rest of the year, he is intent on sustaining his intense focus on two aspects: technical optimization and marketing. "Climbing robots are a niche market, but key to the green energy strategy. Maybe, we (X-Lab) can grow into the sector's No1 and China's ABB," said Shao.